Scott was a vibrant 28-year-old young man & cherished son. He was a respected/admired teacher/coach in the city school system, which was not the environment that he grew up in. He was good natured, kind, giving, sincere, caring, son, brother, grandson, friend, teacher, mentor, coach as well as an active member of our community. He lived life wanting to make a difference in the lives of each child/player. He repeatedly stated to his students/players that he only wanted them to succeed. On October 31, 2004 , in one brief tragic horrific moment a reckless drunk driver who was a repeat offender took Scott’s life. The driver of the car was 23, had two prior DWI convictions. He had no license, yet still chose to drive, while intoxicated. He has pleaded guilty to one count of first-degree vehicular manslaughter, two counts of driving without a license and two counts of driving under the influence. 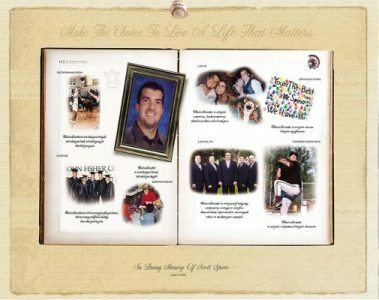 Scott’s contribution to those whose lives he touched were visibly recognized through the course of his funeral. There were thousands that attended and many more that shared their grief with cards, notes, flowers, donations, hugs & tears. The media surrounding this tragic event was quite impressive. For one young man to make such a difference in the lives of others is truly a statement of how he lived his life. Many of us will never achieve that level of impact to others that he did in such a short time. Scott Lived A Life That Mattered. Our goal is to continue Scott’s dream/passion to make a difference in our community & the lives of our children through education, coaching/mentoring. To help us achieve this goal we have established the Scott Spino Foundation, Inc. All proceeds received from our fundraisers as well as donations will be placed in the fund for distribution to the community. Live a Life That Matters!! !